The Shree Shankheshwar Parshwanath Jain Temple is one of the Jain Pilgrimages found in the state of Andhra Pradesh. This temple is located in the district of East Godavari, in a village called Gummileru, which is in the revenue division of Rajahmundry. This temple is notable for its construction. Opulent Rajasthani marble was utilized in the construction without any iron used in the making of the temple. The idols in this temple were discovered in the year 1977 during an excavation that took place as part of the construction of the National Highway 5. When the local community started worshipping these deities, it was decided to build a beautiful temple in order to give them the proper respect they deserved. 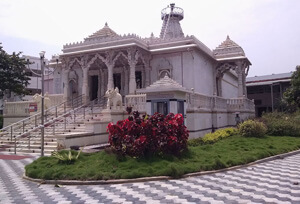 This is how the Shree Shankheshwar Parshwanath Jain Temple came to be built. The statues that were unearthed here were those of the Tirthankars like Lord Parshwanath. The religious figures were depicted as seated in the mudra of ‘Ardha-Padmasana’. These statues were dated and found to be more than 2000 years old. They were thought to have belonged to the Mauryan Dynasty that ruled this part of India. This is a testament to the fact that Jainism was a thriving religion during this era in India. The Jain Sangh was instrumental in constructing this temple. Great care was taken to ensure that the temple was constructed on the very same spot of the discovery. The deities were reinstalled in the year 2006 by Acharya Shri Jayantsen Surishwarji Maharaja. Today, the temple lies contently in the midst of lush and well-maintained gardens. The village of Gummileru is situated on the Godavari river’s east bank, near the Bay of Bengal. The nearest airport to the temple is Rajahmundry, which is about 50 km away.